[UPDATE 10/17/17] Starting today, get your hands on the Dell Visor! 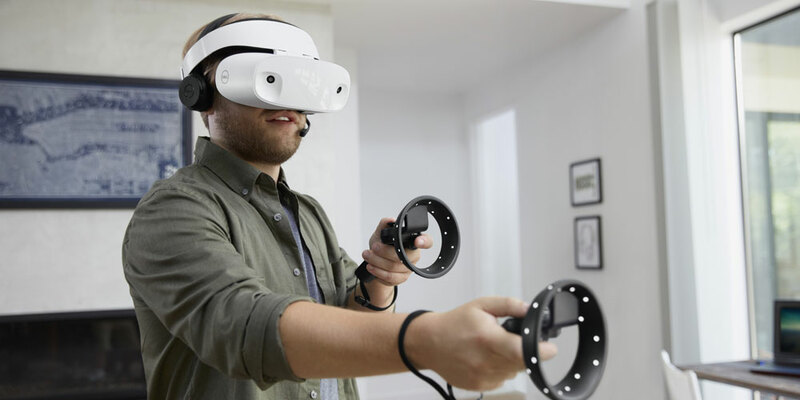 Through the Dell Visor headset and one of our compatible Windows 10 PC’s you now have access to Microsoft’s new Mixed Reality platform, blending the physical world with the digital world to create a variety of gaming and lifestyle experiences. Learn more on Dell.com/visor. Also, beginning Saturday, October 21, try out Microsoft’s Mixed Reality for yourself in 200 U.S. Best Buy stores. The demos include 360 degree videos, and more. Ah, the thrill of a first. Remember your first bicycle, or skateboard, or scooter? The rush of the wind, that incredible sense of freedom? We’re having one of those seminal moments right now with the imminent release of the Dell Visor, our first-ever mixed reality headset for the Windows Mixed Reality (MR) platform. At Computex 2017, we gave people a peek at our headset design, and we’ve spent the last few months perfecting every aspect. In partnership with Microsoft, Dell is excited to offer a mixed reality headset for the masses, building on our leadership in VR and our work with HTC and Oculus to bring you accessible, immersive VR experiences. Last week at IFA, we announced additional details on the Dell Visor and reception has been overwhelming from customers and press with several honoring it with a “Best of IFA” title including The Telegraph, Ubergizmo, Recombu and Deccan Chronicle. Now the wait is over! The Dell Visor is available for pre-order today on Dell.com/Visor and BestBuy.com in the US and Dell.co.uk/visor and PC World in the UK. The Dell Visor will start shipping globally on Oct. 17, just in time for the holidays at $349.99 USD (headset) and $99.99 USD (controllers), or $449.99 USD (headset and controllers kit). It will also be available at the Microsoft Store, MicrosoftStore.com, Best Buy stores, BestBuy.com and other retailers starting in October. The headset is sleek and stylish, with gorgeous white contours, complemented by the black handheld controllers. The flip-up visor is engineered for convenient transitions, but it’s a cool sensation just raising and lowering it, like a sleek pair of Ray-Bans. Dell Visor is a super comfortable VR headset that should win over the haters. Now let’s talk comfort. Tech Radar says the “Dell Visor is a super comfortable VR headset that should win over the haters….The headband is easily adjustable for any size head, weighted for a more stable feel, and the headset is designed to avoid pressure on the user’s nose and cheeks, so you can wear it for extended periods without feeling like your face is tired.” The thoughtful design even extends to cable management, routing cords to the back for better freedom of movement so users won’t trip over themselves. But does it deliver? Oh yeah. Beyond looks and comfort, the Dell Visor offers an optimal mixed reality experience. Prepare to escape into amazing new worlds – and the digital office if you need – with an immersive, life-like, MR experience with high resolution of 1440 x 1440 per eye, dual 2.89” LCD panels and blazing refresh rate of 90Hz. The Fresnel lenses deliver a field of view of 110 degrees and a breathtaking 360 panoramic view. Thanks to our partnership with Microsoft, the visor takes advantage of the same technology used in the Microsoft HoloLens including 6-DoF, inside-out tracking, with the headset itself able to scan your surroundings instead of satellite emitters positioned inside the room. Meaning that it takes less time and no equipment for set up, so you can immerse yourself in mixed reality experiences right away. . Speaking of Gameplay, you can access games and other MR content via the Windows Store at launch and Steam Store in the future. Read the Microsoft blog to learn more about immersive mixed reality experiences. 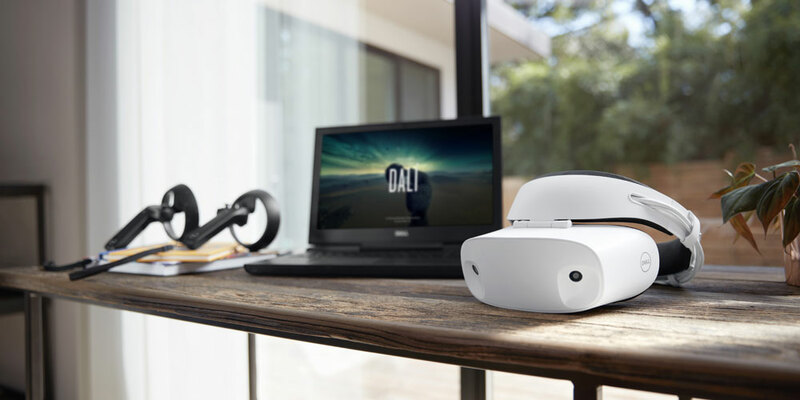 The Dell Visor is compatible with many Windows Mixed Reality PCs including Inspiron 15 7000 Gaming laptops and Inspiron Gaming Desktops and additional PCs that we are working with Microsoft to qualify as Windows Mixed Reality Ultra PCs. If you are planning to pair your Dell Visor with an existing PC, Dell recommends a laptop or desktop that meets the Windows Mixed Reality Ultra PC specifications as they offer greater intensity and a broader selection of experiences. Check the Microsoft blog for more details. We are also offering bundles starting with the Dell Inspiron 15 7000 Gaming laptop with an NVIDIA 1050ti, Dell Visor and Controllers for $1249. Stay tuned for more bundles that will be featured on Dell.com/visor. The VR market is young but ready to rock, expected to grow to more than 215 million active users by 2025. We’re thrilled to jump in at the water’s edge with the most VR-ready solutions of any PC company. Whether you’re a power gamer or a virtual beginner, Dell wants to be your end-to-end technology partner offering you immersive experiences you will love. Let’s jump in together!